Around the rural city of Mildura, this is the big one. Actually, forget Mildura, around Australia this is the big one. Nope, scratch that even, around the world this is the big one! A spot of real cultural significance and the birthplace of humanity in Australia no less, it’s hard to believe this place is only 110km away from Mildura. This article was written in conjunction with Mildura Regional Development Agency. Well this incredibly special place is, of course, Mungo National Park. Host to the oldest known cremation in the whole world, Mungo Lady, and the oldest known humans found outside Africa (Mungo Man), Mungo National Park is one of Australia’s most important reserves and is located just an hour-and-a-half ride across the Murray from Mildura and into New South Wales. 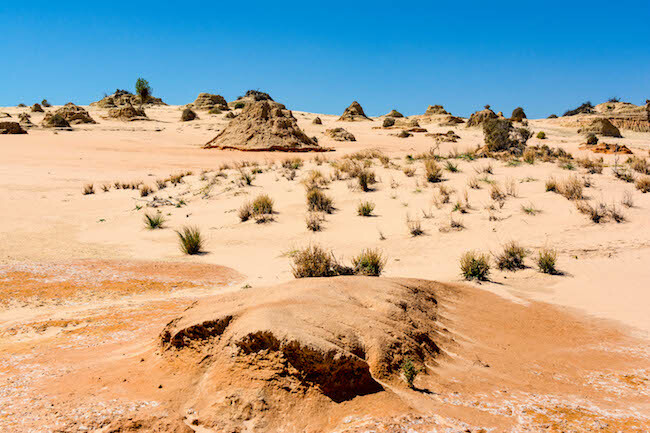 Mungo National Park is also special because of the Willandra Lakes, which are situated within its boundaries and have been UNESCO World Heritage listed for their natural beauty and cultural significance. 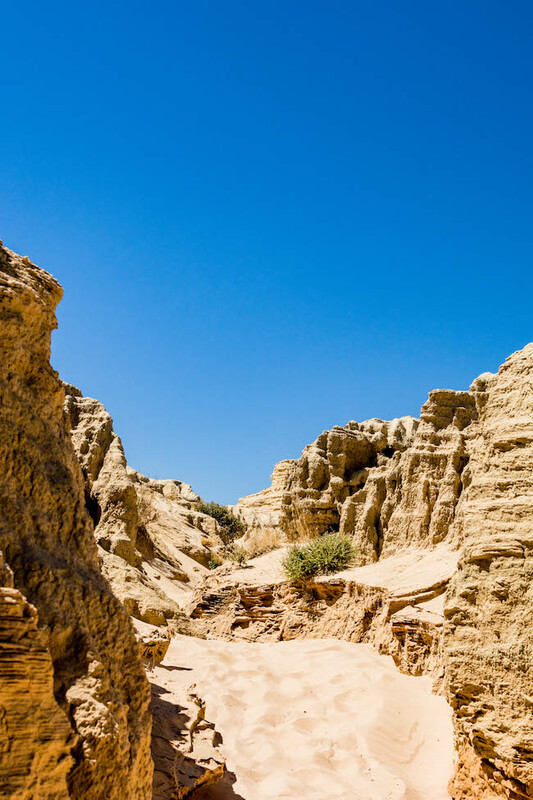 Due to the amazing findings here, it’s fair to say that Mungo National Park proves that a deep cultural and spiritual system had developed in early humans, but for all its importance, it’s still wildly and delightfully off the beaten track. In fact, only 3% of sites are listed in this national park. So with such a compelling backstory, and so few other tourists, how could you resist a trip here? 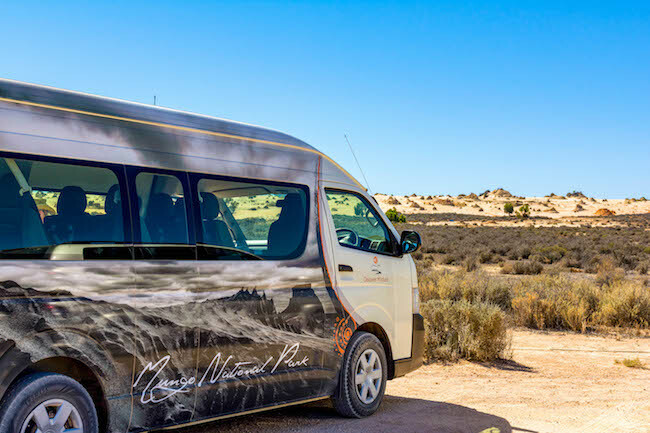 Phil and Alison from Discover Mildura are an incredibly knowledgeable duo who are fully licensed to take visitors into Mungo National Park. Part of the charm of this amazing trip is the last 95km ride, which is made on an unsealed road. It’s a road that Phil’s van was more than capable of handling, although your average city run around might struggle! Like many journeys in rural Australia, on your way to Mungo you’ll have to watch out for other road users – and in these parts it mostly massive trucks going to and from the bentonite mines dotted around the landscape here. Placed sporadically are signs warning you about the rough surface, but like handing over your CD’s to an ex, it feels more like an afterthought than a genuine attempt at something meaningful! 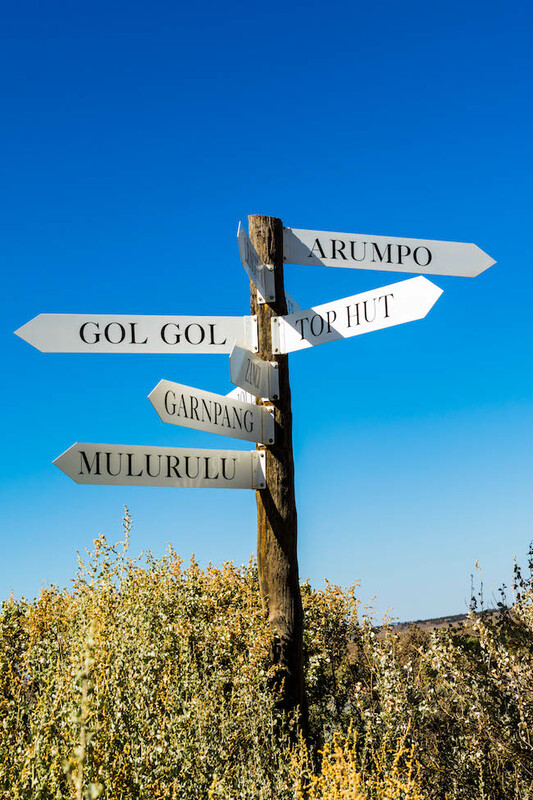 The first stop when you arrive at the National Park is the Mungo Lookout. 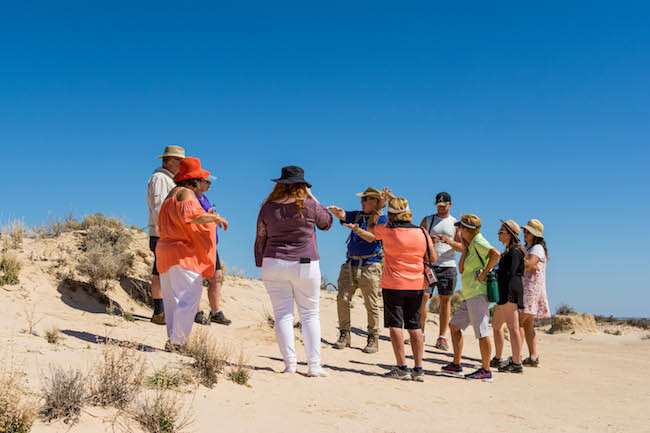 This offers spectacular views around the dried bed of Lake Mungo, and in the distance, you can see the Walls of China – the spectacular area of the park that makes Mungo so special. But just as special was Alison’s banana bread and fruit cake, which we enjoyed there! Made with local ingredients taken from their backyard or sourced from around the Mildura region, it added a glorious homegrown touch to the eco-tour, with the queue of folks seeking her recipe standing as a good testament to the taste! After refuelling with coffee and cake (is there a better combination?) it was back to the van for the 2km trip into Mungo proper. The visitor centre there is so well equipped with facts about the area it makes for a fascinating starting point. Plus the huge replica of a giant wombat that would have roamed the earth during the time of Mungo Man was pretty astounding! That said, it was still the elderly kangaroo that wandered up to the door of the centre that really stole everyone’s hearts! 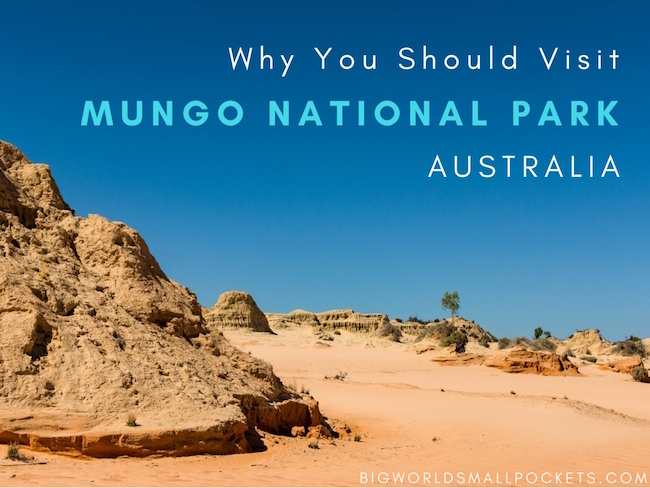 Phil’s knowledge of Mungo National Park is incredible and past the boardwalk is where the action really happens. 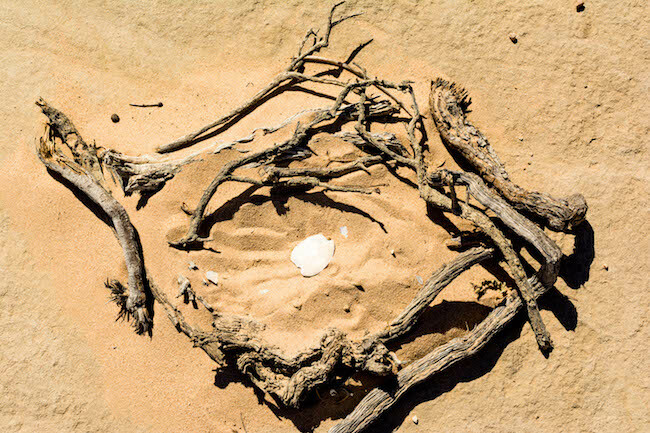 Here you can see fire pits, warming clay stones and fish bones from the indigenous people who ate here 12,000 years ago! 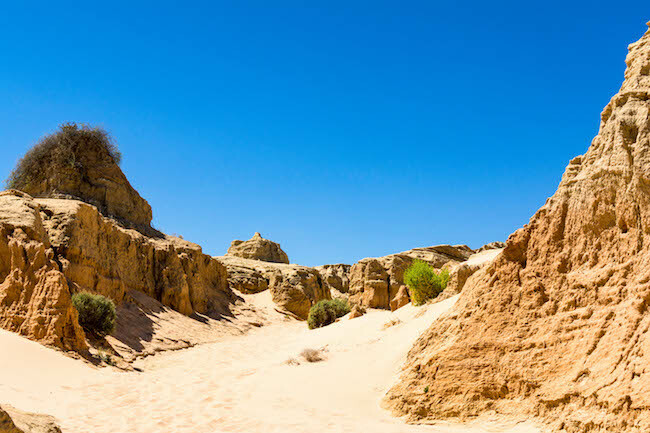 Yes, Mungo National Park is a place that’ll have your imagination running riot. Indeed the black scorch marks on the white and pink tinged earth will have inquisitive minds reeling back to the days when modern man had yet to emerge and the awesome power of nature still ruled. But the landscape is also mind-boggling and likely to evoke feelings of shock and awe, at least it did in me! Yes, this is a land that has been here for thousands of years and will remain long after we’re all gone. It’s seen multiple ice ages, it’s seen the rise of fall of cultures and it serves as a reminder of what can happen when the water really runs out! The columns of lunettes that stretch into the open air could have been transported from Mars, while the glorious, pristine white sand of the Walls of China look like they’ve come straight off a tropical beach. This juxtaposition of colours and landscapes is part of what makes this place so utterly glorious and Mungo National Park certainly isn’t somewhere you’ll forget in a hurry! Moving on with the trip, lunch was served in the well-equipped BBQ area by the shearing shed and featured an excellent array of sandwiches and local fruit / nuts- all washed down with orange juice or one of the many bottles of water that Phil kept on pulling from his esky like magic. Everything that’s consumed on site is taken out, often to feed Alison’s chicken – who then provide the eggs for her cake in a glorious circle of life. The whole day is finished off by another powerful moment. First, we heard the story behind a beautiful stone sculpture by Badger Bates, before Phil explained the history behind the replica footprints that have been installed next to the sculpture and why, those in the know, believe one-legged hunters with hopping speeds of up to 37km/hr once roamed the earth here. Well it was back to the air-conditioned bus and back to Mildura. Of course, we were sad to leave this mystical and magical land behind, but delighted to have been one of the lucky people to have seen it! After all, it’s not every day you get to visit Mungo National Park, one of Australia’s truly great spots. I love that rugged scenery Steph; definitely well worth a visit. Not too far from NZ here which is neat, although we’ll be head State-Side soon. Fantastic Ryan, then definitely get Mungo on your list. Wild scenery and so off the beaten track! Ideal Australian travel material! This is a place you should visit when you’re planning a vacation trip to Australia, a great place to make one in a lifetime wonderful experience.